Wow I so remember the Bob Levels. That's so awesome. I am shocked to see this. Even after all this time, even after Starcraft itself has ebbed into the realms of niche fandom, PC Gamer still rehashes mods from the ages. Joel said he had a bit of a hand in things in LotC. He of course is modest (as usual). Joel's contributions to LotC's development in all respects were vital to its creation. Voices, storyboarding, music, and image work. I only wish he had gotten his rightful nod in the PC Gamer article. Joel, if you can hear me, aloha!!! Email me (elye.sackmary [at] gilacorp.com) and let me know how you're doing these days. 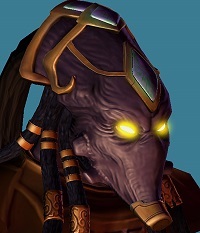 A co-worker of mine at Dell somehow found my real name by googling the Oracle alias since he's a starcraft freak and pointed me to this thread. Small world. EDIT BY LAVARINTH: Adjusted e-mail to prevent spam. Last edited by Lavarinth on Wed Dec 05, 2007 2:32 am, edited 1 time in total. Oracle, you can reach Joel at "steudler1 [at] comcast.net." That's his e-mail through his profile, also I believe the same one he and I used to communicate. Hope you two get in touch.